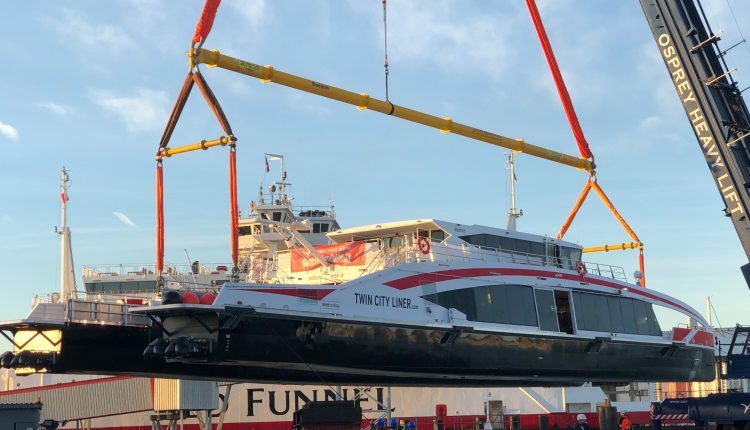 UK-based Osprey Ltd., a specialist in the onshore and offshore transportation and lifting of heavy or abnormal loads, lifted a 72.5t catamaran using a 1,000t capacity Liebherr mobile crane and a one-over-two Modulift spreader beam configuration beneath its hook. The rigging gear was sourced from FLG Services, the specialist lifting division of A-Plant. The first challenge was removing the vessel, which is due to arrive in Vienna in time for the start of the new season at the end of March 2019 from its building. Osprey selected two, six-axle Goldhofer self-propelled modular transporters (SPMT) to work in tandem to move the load to within the reach of the Liebherr LTM1800D. The crane was complete with a 36m high rig, designed to accommodate a 3.7m centre of gravity offset and different elevations of the boat’s lifting eyes. A Modulift MOD400 was used at a 29m span beneath 29m long and 26.4m long top slings to balance the lift. Two MOD70H beams were used underneath, one at 5.5m long and the other at 4m. Again, two different lengths of sling were used to connect them to the top beam—3m at the stern (back) and 3.9m at the bow (front). The slings that met the lifting eyes at the bottom of the rig were all 4m in length.